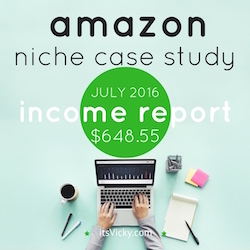 July has come to an end and it’s time for another monthly update of my Amazon Niche Case Site. July was filled of summer, travel, beach and fun. Didn’t work much with the site. This is exactly the setup I was looking for, a handsoff site with outsourced content. Don’t get me wrong a lot of work goes into the site, but all content for July and August has been submitted and scheduled ahead of time. The schedule feature in WordPress is a life saver during the summer months. This allows me to submit new content on a regular basis. Right now I’m sitting in Sweden summarizing last month’s numbers. The beauty of working for yourself, from anywhere at any time. Let’s look at the numbers for my Amazon case study site, numbers for July 2016. This is a site based on outsourced content. The main traffic comes from organic listings in Google and other search engines. Sessions, users and page views are up from previous month, this is a good sign. Hopefully my dip due to seasonal products were last month and from now on we will see an overall climb in traffic numbers. The one thing that is dropping is session duration, I need to look into this further, figure out if it’s because my visitors click through to Amazon earlier due to some picture ads that I added further up in my content or if unrelevant visitors are landing on my site… need to look into the bounce rate here. Overall all I’m happy with the positive trend. I use SemRush to check my gained and lost rankings, I also use them to see my keyword rankings. Again I’m happy about the gained keywords, 617 gained keywords an upswing from the month before. The site also lost less keywords than the previous month, so a great sign. I love their new addition – notes. This will give you additional information about Semrush and Google, you can also add your own comments in the note section. A great addition that makes a great tool even better, well done SemRush. This is always an interesting number to look at, hopefully the sales numbers will follow the traffic increase and keyword gained. Happy to see that the numbers are increasing from June to July. The site is still focused on a “winter” niche so very happy with the July result. Can’t wait to see what this site will do during the cold months. i just stumbled upon your article through twitter. I always love to see income and progression reports. but with expenses, shouldn’t you add your website costs, listbuilding, etc? i think it will show a more clearer picture of the actual money you’re making with your website. I’m going to do this too soon. my website only went live last sunday and today i published my 2nd article. I’m documenting my journey into setting up a profitable blog from the start. These days too many people are presenting themselves as marketing guru’s so this was my usp. If you look at the first couple of months you can see larger expenses WordPress theme purchase and domain for example. The site is on shared hosting, same thing with the list building, the cost is shared through many sites. You are right though, I should calculate the cost even if it’s just a few dollars / site and include that in the expenses. I appreciate your feedback and will ad those costs in.